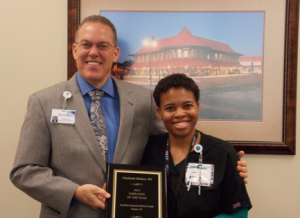 HAMLET— Stephanie Hudson, registered nurse, has been named 2014 Employee of the Year for Sandhills Regional Medical Center. The recognition is the highest honor a hospital employee can receive. Employees are nominated for the award by their colleagues based on their commitment to patient care, their professionalism and their contributions on the job. Hudson was chosen from among 248 employees for the recognition. Stephanie Hudson accepts the Employee of the Year award from Sandhills Regional Medical Center CEO David Clay. Hudson has worked at Sandhills Regional Medical Center since November 2003. She currently serves as a RN, Clinical Systems Analyst. She has also worked as a staff nurse in Acute Care in the past, and has been in her current role for the past two years. Hudson has received many honors in the past, such as Nurse of the Quarter 2007, Nurse of the Quarter 2009, Nurse of the Year 2012, and her most recent honor as Employee of the Year 2014. “Stephanie energizes those who come into contact with her due to her overwhelming desire to do provide better healthcare in her community through electronic system adoption. Additionally she is the first person to volunteer to help even when the tasks are not directly related to her job description. I will often pass on information pertaining to a particular system or process only to find out that she has already discovered it and has put an action plan into place. Stephanie is one of a kind and I consider myself lucky for having the opportunity to work with her,” said Brian Bissonnette, Hospital/Market IT director & Facility Information security officer. Hudson was honored by the recognition.